starting point of our talk, which is the beginning of the second Spanish period of the history of Florida. From the very beginning of the Spanish settlement in 1565, St. Augustine has always had a fortification. This fortification affirmed the Spanish title to Florida, and protected Spanish vessels returning to Europe via the Gulf Stream. As you know, the Gulf Stream flows along the east coast of Florida. The first St. Augustine fortification was an Indian communal house hurriedly equipped with an encircling breastwork, a shallow ditch, and gun emplacements. Then, for the next hundred years, one fort made of wood or wood and earth succeeded another until the advent of the stone fortification. Charleston (South Caroline) in 1670.
gundeck. Also, the rows of small rooms along the walls made the courtyard bigger. work performed on Castillo was the en2kargerment of the ravelin by/Pablo Castello in 1762. Regarding Castillo de San Marcos, the main wall was in good condition. However, the cracks reported previously had widened, particularly those in the water battery wall. The piers and the intrados of the vaults were excessiyely damp, due to the steady filtration of rainwater through the gundeck.pavement. The pavement had become worse each passing day, with-an increase in cracks and a loss of hard surface in places. The entire parapet needed repair, particularly on the east side, where cannon-fired salutes and signals had broken or displaced many stones or both. That same July, on the 1lth, in far away Europe, the French Revolution had broken out. It shattered the peace that had prevailed since 1783, and ushered in the 25-year long period that changed the political and social face of the old country. It was 1793 before Spain became finally involved in war with revolutionary France. The National Assembly proclaimed the hostilities on March 7, and the Spanish reciprocated on the 23d. Six days later, Spain and Great Britain became allies against France. The treasurer requested on September 4 for the rehabilitation of the ........ Castillo-vaelt known as the royal treasury (Room 16),as his office and repository of the King's coffer. An inspection revealed that all vaults were filtrating rainwater excessively through cracks in the terreplein, and the water was damaging the supplies stored in them. however, there were four vaults that leaked less than the others, and those were the flour storeroom (No. 13), the old chapel vault (Room 14) used as the room for the officer of the guard, the general storekeeper's office (Room 15), the upper story of which contained merchandise for the Indians, and the vault wanted by the treasurer, in which the second story held items which had to be kept dry, such as tents, sandbags, and rope. The long awaited French-financed invasion of East Florida by the Amerricans took place in the summer. ne, the Cubo Line and three redoubts controlling the crossings of the San Sebastian River, were chosen to make a stand,if necessary and consequently repaired. Castillo on July 13, 1d asked Engineer Diaz for a report on essential repairs. The rainwater filtration through the terreplein, replied Diaz, had rendered all the vaults unfit to serve as storerooms or to lodge troops. .... I <. .. .
Diaz suggested a solution to the water filtration problem. He would uncovet the extrados of the arches by removing the terreplein earth fill, plaster the extrados with a good mixture making sure that their grade caused the water to run to the top of the piers between vaults, where he would install drains reaching out through the curtain, put the fill back, and rebuild lhe terreplein pavement. 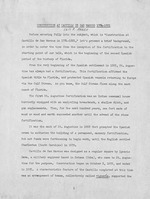 In faraway Europe, the obnoxious British conduct toward her since the Peace of Basel, led Spain on August 18 to conclude the Treaty of San Ildefonso with the' Frenoh Directory for mutual friendship.9h On Dec. 22, St. Augustine found out that Spain had declared war on Great Britain the previous Oct. 7.
stillo d San M wrcos was put in condition to withstand bombardment. A cover of eatth and wood, thick enough to be "bomb proof," was built on the terreplein above the powder magazine (Rooms 10 and 11). The courtyard walls were lined, armor-like, with thick boards, and just outside the doors of the vaults, thick-board screens were erected, all this for protection against flying "bomb" fragments. terreplein pavement at the west and south curtains had been repLaced, and the parapets and firing steps rebuilt. The west vaults, in use as food and ordnance storerooms (probably Rooms 9, 8, 7, 6, 5, and 4) were for the first time in many years free of leakage. And so were the south vaults used as ordnance storerooms (Rooms 3 and 2), the guardrooms (Nos. 1 and 29), sallyport, and jail (Room 28). Terreplein replacement above four vaults at the east curtain, in use as jail (Room 27) and food and engineer supplies storerooms (Nos. 26, 25, 24), and the rebuilding of the a-barbette parapet, had begun. The work progressed slowly because only 17 laborers and 13 soldier prisoners were available, but had been finished by year's.end.16 . 1802. All parties involved-in the European war had suspended hostilities, but a peace treaty was not attained until March 27 at Amiens. Ja..
at Castillo de San Marcos, for = .. + nonnn received e ..e:.. very last day of = f"he ""---- '.' ramp was removed, rebuilt.At the some curtain, the terreplein slab and earth fill above a vault (probably Room 12) were removed, the extrados probably pargeted, and the fill replaced ....ge. b-e. .n San Pablo a large crack was filled in.-At the south curtain, the mochetas (sconcheons) of the gate door and of the bridge support were chipped, plastered, and whitewashed. The wooden ravelin and main bridges were rebuilt as fixed bridges, the rails painted, and the remaining woodwork treated with pitch.122 All progress considered,-the terreplein pavement above vaults No. 10, 11, 13, 1l4, 15, 16, 17, 18, 21,-22,-and -. 23 had yet to be replaced. '- ... ....... I .. s On February_ 1 s, ..
Great Britain on December 12. I4.(l. On April 13, a council of war endorsed Nita's plans for constructionand defense. .
broken-up sallyport floor, and pouring a new one made of riprap and lime. stored there was completely spoiled. '* The interior of the powder magazine shown in the attached illustration is essentially the same as the interior I of Room 26 when completed and put to use. - wooden-floors.of-the.. upper and lower stories andthe stairway repaired. The old magazine became a lumber storage by opening the ventilator (in Room 10), putting a wooden grating in it and installing a -piket -gate--with-- lock at the doorway. 1 a 5-foot-high palm log revetment was built to keep the glacis fill in place. .-de-San--Marcos.--The 2-inch-thick planks of the main bridge .were..replaced ....-..
was pain e-dwith-1ead-colored paint. ..
_.the._earth..removed..from the protective, cover above, the former powder maga- .. zine. (Rooms 10 .and11). The council- of war meeting orA February 2 considered-- the- views and- the-defense-plan -of Engineer--Hita;. It- resolved to begin- mmediate-the-repair of C-ubo Line"
the-Gate and-Castillo, -the- erection-of the palm-log casing -for-that segment -. people had revolted against Napoleon on May 2 and declared war on France. were extracted and poured on the approach to the counterscarp in order to form the glacis. ^*ts +-r a .. l o l -nc .. A ........CC . delivered by local authority or to prevent seizure by a foreign power. ..... h ..py e. ee It -resolved to rebuild,pea -the-- ----a... vein-bridg6f Castillo de San Marcos so that it could stand the-weight- --of the artillery transported over it. -----On July.30, Governor Estrada- 6a= i =6n . ...... ?X *. ........ . .
the arrival of one in December 1816.
in order to defend the avenues of access to St. Augustine. needed by the fortifications and certain public buildings in St. Augustine,. the structures in question. Castillo de San Marcos had the entire terreplein surface ruined, and the three salients of the water battery cracked from the wall. The foundation of the salients had been eroded by the sea, and conseSquently stones became easily dislodged. The repair of the terreplein and the salients would amount to 7,0!5 pesos. The two vaults serving as powder magazine (Rooms 25 and 26) needed replacement of wooden floors and wall paneling at a cost of 755 pesos, and the replacement of the wooden components of the other vaults used as provisions storerooms was figured at 849 pesos. considered in building it. If city defense had been the structure would have been provided with a better capacity to flank the terrain fronting the line. ment should be made of a stronger and better-bonding mix. Amelia Island, had fallen on June 29 to insurgents sponsored by several Hispanic American republics. cution of the enterprise was unsuccessful. TIna ba4 yh-. S hdl ~A m- .. States ousted the insurgents in order to secure order on the frontier, and held Amelia under its custody until the end of the Spanish rule. -is m--' m np- werid Governor Coppinger wanted the remainder spent on projects most conducive to the defense and security of the city. The engineer pointed out that repairing the terreplein, plastering the intrados of the vaults, and completing the north covered way stockade at Castillo, and renewing the Cubo Line and its moat were tasks that could not be neglected. sunrise as the date for workers to report to Castillo, and begin work on it. But he warned the masons that, unlike previous occasions, they would have to bring their own tools because there were none in the engineer supply storage. The work performed in August and September cost 1,599 pesos. 1819. A treaty, known officially as Treaty of Amity, .Settlement, and Limits and commonly as the Adams-Onis Treaty, was signed in the faraway capital of the United States on February 22 by American and Spanish representatives. Spain ceded the Floridas but adjudicated to the United States her $5,000,00C-debt to the citizens of the latter country. The Americans, on the other hand, accepted the Sabine River as their southwest boundary, thereby surrendering any claim to Texas as part of the Louisiana Purchase, but at the same time acquiring whatever claim the Spanish had to Oregon. Upon request by Governor Coppinger, Engineer Fano submitted on February 17 a report on the condition of fortifications-and public buildings, se..
terreplein had been repaved in two bastions and three curtains and all the firing steps completed. The bridges had been reconstructed but without draw spans. The covered way had been cleared of mounds of earth, which had been used to build all the required traverses, ~ .L..... S-I.. L J. The stockade had been rebuilt on three fronts..
they and the line were always under the constant repair required by their earth composition. -6 0 : 0 ba d.d "-4- r-. l t.
prompted the arrival of assistance, and the initial aid was in the form of money and an engineer. Go!a' Y m.b-. .
for the territorial transfer. Another one was the removal of ordnance stores from Castillo de San Marcos to vessels for loading and shipment to Habana. The day for the transfer of East Florida to the United States finally arrived. On July 10, 1821,. the several arrangements prepared in advance became formalized, such as the delivery of the fortifications and public buildings by Engineer De la Cruz and Adjutant Pablo Rosete to Lieutenant W. J. Baird of the 3d U. S. Artillery. Then, at h o'clock in the* afternoon, as Governor Coppinger and Commissioner Butler signed the documents of the transfer, the last Spanish detachment marched out of Castillo de San Marcos. One week later, the Spanish departed from the other Florida. Thus ended the 235-year presence in this part of the United States.